Scottish geologist, theologian and stonemason whose geological writings popularized the subject of geologic history. His well-known books include his work on fossil fish in The Old Red Sandstone, and a philosophical reconciliation of his religious beliefs with science studies in The Testimony of the Rocks. All geologic history is full of the beginning and the ends of species–of their first and last days; but it exhibits no genealogies of development. Lecture to the Edinburgh Philosophical Institution, 'Geology in its Bearings on the Two Theologies, Part 1', collected in The Testimony of the Rocks: or, Geology in Its Bearings on the Two Theologies, Natural and Revealed (1857), 220. Because science flourishes, must poesy decline? The complaint serves but to betray the weakness of the class who urge it. True, in an age like the present,—considerably more scientific than poetical,—science substitutes for the smaller poetry of fiction, the great poetry of truth. Lecture Second, collected in Popular Geology: A Series of Lectures Read Before the Philosophical Institution of Edinburgh, with Descriptive Sketches from a Geologist's Portfolio (1859), 123. Nature is a vast tablet, inscribed with signs, each of which has its own significancy, and becomes poetry in the mind when read; and geology is simply the key by which myriads of these signs, hitherto indecipherable, can be unlocked and perused, and thus a new province added to the poetical domain. Lecture Third, collected in Popular Geology: A Series of Lectures Read Before the Philosophical Institution of Edinburgh, with Descriptive Sketches from a Geologist's Portfolio (1859), 131. No true geologist holds by the development hypothesis;—it has been resigned to sciolists and smatterers;—and there is but one other alternative. They began to be, through the miracle of creation. From the evidence furnished by these rocks we are shut down either to belief in miracle, or to something else infinitely harder of reception, and as thoroughly unsupported by testimony as it is contrary to experience. Hume is at length answered by the severe truths of the stony science. The Foot-prints of the Creator: Or, The Asterolepis of Stromness (1850, 1859), 301. Poets need be in no degree jealous of the geologists. The stony science, with buried creations for its domains, and half an eternity charged with its annals, possesses its realms of dim and shadowy fields, in which troops of fancies already walk like disembodied ghosts in the old fields of Elysium, and which bid fair to be quite dark and uncertain enough for all the purposes of poesy for centuries to come. Lecture Third, collected in Popular Geology: A Series of Lectures Read Before the Philosophical Institution of Edinburgh, with Descriptive Sketches from a Geologist's Portfolio (1859), 127. That special substance according to whose mass and degree of development all the creatures of this world take rank in the scale of creation, is not bone, but brain. The Foot-prints of the Creator: Or, The Asterolepis of Stromness (1850, 1859), 160. The development doctrines are doing much harm on both sides of the Atlantic, especially among intelligent mechanics, and a class of young men engaged in the subordinate departments of trade and the law. And the harm thus considerable in amount must be necessarily more than considerable in degree. For it invariably happens, that when persons in these walks become materialists, they become turbulent subjects and bad men. The Foot-prints of the Creator: Or, The Asterolepis of Stromness (1850, 1859), Preface, vi. The existing premises, wholly altered by geologic science, are no longer those of Hume. The foot-print in the sand—to refer to his happy illustration—does now stand alone. Instead of one, we see many footprints, each in turn in advance of the print behind it, and on a higher level. Lecture to the Edinburgh Philosophical Institution, 'Geology in its Bearings on the Two Theologies, Part 1', collected in The Testimony of the Rocks: or, Geology in Its Bearings on the Two Theologies, Natural and Revealed (1857), 223. The geologist, in those tables of stone which form his records, finds no examples of dynasties once passed away again returning. There has no repetition of the dynasty of the fish, of the reptile, of the mammal. The dynasty of the future is to have glorified man for its inhabitant; but it is to be the dynasty—“the kingdom”—not of glorified man made in the image of God, but of God himself in the form man. The Testimony of the Rocks: or, Geology in Its Bearings on the Two Theologies, Natural and Revealed (1857), 178. The primary rocks, ... I regard as the deposits of a period in which the earth's crust had sufficiently cooled down to permit the existence of a sea, with the necessary denuding agencies,—waves and currents,—and, in consequence, of deposition also; but in which the internal heat acted so near the surface, that whatever was deposited came, matter of course, to be metamorphosed into semi-plutonic forms, that retained only the stratification. I dare not speak of the scenery of the period. We may imagine, however, a dark atmosphere of steam and vapour, which for age after age conceals the face of the sun, and through which the light of moon or star never penetrates; oceans of thermal water heated in a thousand centres to the boiling point; low, half-molten islands, dim through the log, and scarce more fixed than the waves themselves, that heave and tremble under the impulsions of the igneous agencies; roaring geysers, that ever and anon throw up their intermittent jets of boiling fluid, vapour, and thick steam, from these tremulous lands; and, in the dim outskirts of the scene, the red gleam of fire, shot forth from yawning cracks and deep chasms, and that bears aloft fragments of molten rock and clouds of ashes. But should we continue to linger amid a scene so featureless and wild, or venture adown some yawning opening into the abyss beneath, where all is fiery and yet dark,—a solitary hell, without suffering or sin,—we would do well to commit ourselves to the guidance of a living poet of the true faculty,—Thomas Aird and see with his eyes. Lecture Sixth, collected in Popular Geology: A Series of Lectures Read Before the Philosophical Institution of Edinburgh, with Descriptive Sketches from a Geologist's Portfolio (1859), 297-298. The science of the geologist seems destined to exert a marked influence on that of the natural theologian... Not only—to borrow from Paley's illustration—does it enable him to argue on the old grounds, from the contrivance exhibited in the watch found on the moor, that the watch could not have lain upon the moor for ever; but it establishes further, on different and more direct evidence, that there was a time when absolutely the watch was not there; nay, further, so to speak, that there was a previous time in which no watches existed at all, but only water-clocks; yet further, that there was at time in which there we not even water-clocks, but only sun-dials; and further, an earlier time still in which sun-dials were not, nor an measurers of time of any kind. Lecture to the Edinburgh Philosophical Institution, 'Geology in its Bearings on the Two Theologies, Part 1', collected in The Testimony of the Rocks: or, Geology in Its Bearings on the Two Theologies, Natural and Revealed (1857), 211. The six thousand years of human history form but a portion of the geologic day that is passing over us: they do not extend into the yesterday of the globe, far less touch the myriads of ages spread out beyond. My Schools and Schoolmasters, Or, The Story of my Education (1854), 441. Letter to Burke A. Hinsdale, president of Hiram College (10 Jan 1859), commenting on the audience at Garfield's debate with William Denton. Quoted in John Clark Ridpath, The Life and Work of James A. Garfield (1881), 80. 10 Oct - short biography, births, deaths and events on date of Miller's birth. 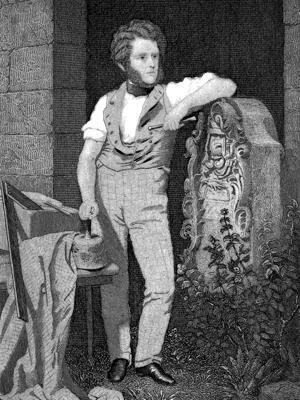 Hugh Miller: Stonemason, Geologist, Writer, by Michael Taylor. - book suggestion.